March 11 2018, what a glorious day. The luck of the Irish was certainly with us this day. Sunny and warm almost T-Shirt weather. 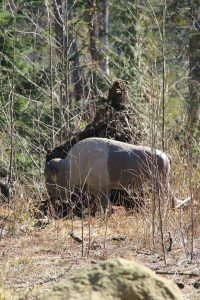 Walking around the property one would find alligators in the river, moose in the trap field, buffalo in the brush and many more animals (targets) strategically placed to challenge the 109 participants of the Nanaimo Fish and Game Archery Divisions annual St Paddy’s Day 3D shoot. We would like to thank those that gave of their time in setting up the course, taking registration, arranging the draw table, preparing the lunch, the cleanup and most importantly the 109 registered archers. Undoubtedly the weather leading up to and the day of the event helped bolster the numbers. The enthusiasm of the attendees speaks volumes to the health of archery on the Island. I never even caught site of a single leprechaun the entire day but they are sly little fellows, not to say they were not around in disguise? A Sunny warm day, good health, meeting old friends, making new acquaintances and shooting arrows …. That was my pot of gold, what could be better? Those, that for reasons unknown could not attend are most certainly ite ag an ead (Irish gaelic) or green with envy (English) for they most certainly missed one of the best shooting days this year so far. 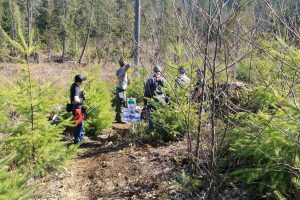 The Nanaimo Fish and Game Archery Division like every other club rely on the greater Vancouver Island archery community’s support to make these events successful. All of the clubs on the Island need our support so remember, get out there whenever possible, get involved with the operation of your local organization and attend as many shoots as possible, it makes us all stronger. Don’t rely on the LEPRECHAUNS to do all the work…..
CSSA Talking Points Re. Bill C-71 The Firearms Owner Harassment Act.